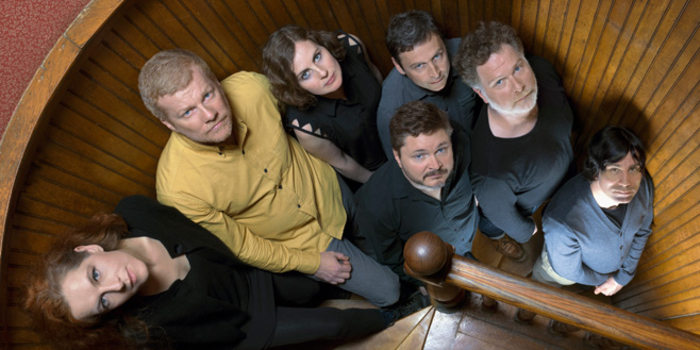 THE NEW Pornographers are something of a Canadian indie supergroup, featuring the diverse songwriting talents of AC Newman, Dan Bejar, and particularly Neko Case. They’ve been around since 1999, have released six albums under the TNP moniker (not to mention all they have done as solo artists/members of other bands ), and while they are not the most consistent in terms of quality, there is yet not a New Pornographers’ album which does not merit attention and contain within it some sparkling indie gems showcasing the best of what the genre has to offer. This holds true of new album Brill Bruisers (a nod to the New York songwriting factory of The Brill Building ), out on Matador Records, but there is a difference - normally guitars dominate, but this time, the most over-looked members of the band - keyboardists Kathryn Calder and Blaine Thurier - step towards centre stage. The opening title-track, a big grandstanding number, swells with overlapping vocals, stadium drums, and keyboard punctuation. Electronics and synths give Case’s ‘Champions Of Red Wine’ a distinct - and very effective - new-nawe/new-romantic meets Stevie Nicks vibe. Bejar though keeps things ‘guitar’ with The Only Ones-esque ‘War On The East Coast’ but even his ‘Spydr’ is infused with synth soundscapes and bleeps, ranging from low-key to cathartic, and managing to make a harmonica solo work in this context. Possibly though, the album’s finest moment is also its shortest - 90 seconds - and, indicative of the place of keyboards on the album, it was written by Calder; ‘A Drug Deal Of The Heart’ is indie-pop par excellence; melancholy, sweet, catchy, but never one for the mainstream. Despite inconsistent moments and a few pedestrian numbers - at 13-tracks there is always the risk of spreading things too thin - there are at least three other tracks which challenge for ‘album highlight status’. ‘Backstairs’ sees guitars and keyboards achieve parity. A full of indie-rocker, with electro sensibilities, the combined effect creates a mini-epic that deserves hearing at an indie disco. Above all though it is the haunting vocal harmonies which showcases just what makes Brill Builders work - TNP’s vocal interplay, their sense of melody, and how they use this to create something infectious, exciting, and inspired. The above description would easily apply to ‘Dancehall Domine’, which dives headlong into invigorating pure pop, with a chorus that is the aural equivalent of a energy rush. Equally inspired is the closing track, Newman’s new-wave rocker, ‘You Tell Me Where’, its secret weapon being the Case/Calder sung middle-8 and the way it leads back into the fist-pumping in the air chorus - lesser bands would have given their right arm to make a whole album’s worth of songs out of just that one minute.